Frontier 2000 Media Group Inc.
Alexandra recounts her experiences as the oldest in a family of ten children, all of whom were earning their educations at a highly-accelerated pace. With warmth, humor and affection, Alexandra draws the reader into the Swann household and shares a story of love, friendship and faith that overcomes obstacles. This twentieth anniversary edition of No Regrets—republished in early 2010—contains an updated foreword by the author. "I especially enjoyed the character sketches of each member of the Swann family, and I would recommend this eloquently written book to homeschool students, graduates, and parents." Tiffany Orthman Home Educating Family. "I was...inspired by this sweet success story...I never felt pressured to accelerate my own children's progress or to switch to the programs the Swanns used. Instead, learning of the family's deep commitment to God's plan for them simply encouraged and empowered me to continue on the path He has given my family." Read thTina Hollenbeck's review on her blog Being Made New. Read the rest of Tina's review here. No Regrets: How Homeschooling Earned me a Master's Degree at Age Sixteen has been recommended by some of the most respected names in the homeschooling movement, including Mary Pride , publisher of Practical Homeschooling Magazine, in her highly acclaimed Big Book of Home Learning, Cathy Duffy, in her well-known Christian Home Educator's Curriculum Manual Junior/Senior High (1997-1998), Christine Field, in A Field Guide to Homeschooling (1998) and Debra Bell, in The Ultimate Guide to Homeschooling, 1997. 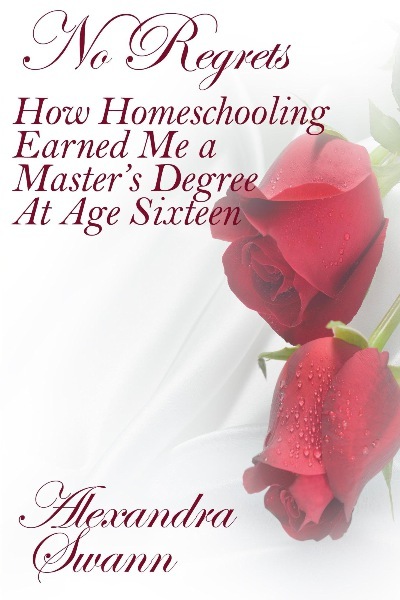 Amazon readers have given No Regrets: How Homeschooling Earned me a Master's Degree at Age Sixteen 22 five star reviews.